Preheat the oven to 350 degrees F. Set up a double boiler on the stove top. Then melt the chocolate and butter in the double boiler, stirring constantly until just smooth. Then remove the bowl from heat and allow the chocolate and butter mixture to cool slightly. Meanwhile, in a medium sized bowl, sift together the flour, baking powder, and salt, and set aside. In the bowl of an electric stand mixer fitted with the paddle attachment, beat the eggs and vanilla extract until frothy on medium speed. Gradually beat in the sugar and continue beating until the mixture is thick, pale yellow, and drizzles off of the beaters like ribbons. Then stir in the melted chocolate on low speed until just combined. Add the dry ingredients into the batter and stir to combine on the lowest speed. Do not overbeat. Then use a rubber spatula to fold in the walnuts or chocolate chips. Use a cookie dough scoop to scoop out even balls of cookie dough and place them on a silpat (silicone) mat lined baking sheet, 2 inches apart. If your dough is too soft to hold together in a ball of dough, cover the mixing bowl and chill the dough through in the refrigerator, between 1 and 3 hours. Then use a cookie dough scoop or use your hands to roll out balls of dough. Bake until the middles have just set, approximately 10 minutes. It is very important not to overbake these cookies. The cookies will look dry and cracked as they cool. Allow the cookies to cool on the baking sheet until they are firm enough to be transferred to a wire cooling rack, 1 or 2 minutes. 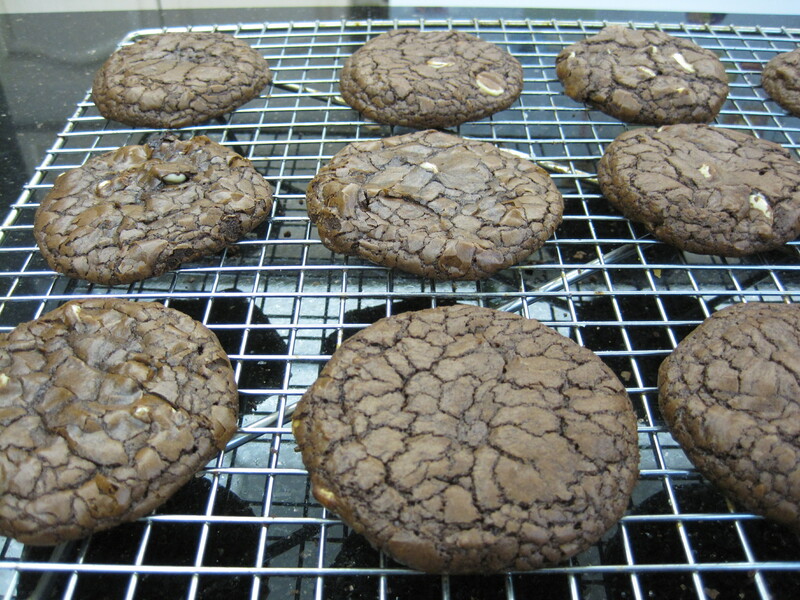 Allow them to cool completely on the wire cooling rack prior to serving. 2 CUPS of chocolate???? REALLY????? WOW!!!!! I bet they are chocolatey!! !